One of the fun projects our JLBG research division has been working on for several years is breeding for winter hardy century plants. One of our latest crosses is between the two plants pictured above, Agave x protoamericana (blue) and Agave salmiana var. ferox ‘Bellville’ (green). These are the two largest agaves that are winter hardy for us, and we were able to cross them in 2014. We are offering seed grown offspring while they last under the name Agave ‘Bluebell Giants’. 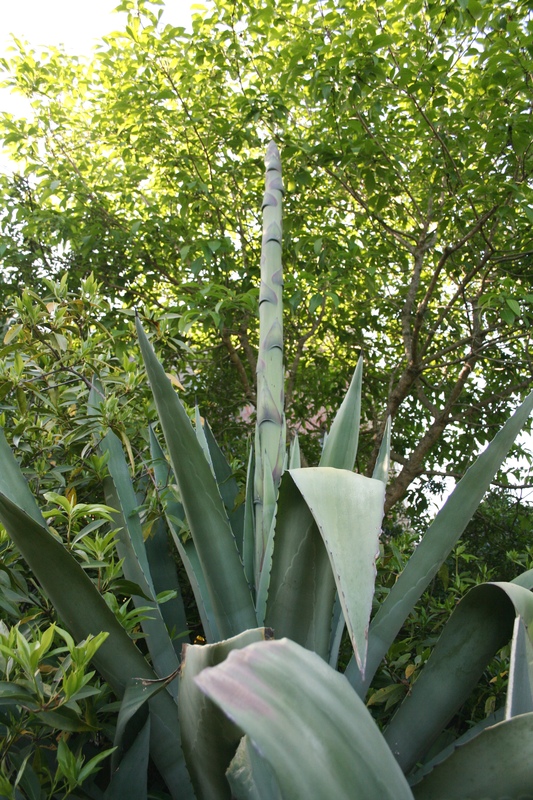 In most cases, our other hybrid agaves are larger and more vigorous than the parents, which in this cases could be HUGE! These seed-grown plants have now filled our 1 qt pots and we’ll be planting our first plants in the garden in spring. If you like giant agave and love to experiment along with us, don’t miss this once in a lifetime opportunity. This entry was posted in Plant images from the garden and nursery and tagged agave, buy succulents, buy succulents online, drought resistant perennials, drought resistant plants, drought tolerant perennials, drought tolerant plants, Open House, Plants for Containers, succulents, succulents for sale, where to buy succulents by Plant Delights Nursery. Bookmark the permalink. I would love to try one of these agave. I live in a 5b region and have a sunny, south facing sandy spot. I have failed with another agave (not from you) which may have required less humid summer conditions. But I have succeeded with some more tender plants such as Franklinia altahama. Please contact me if you want me to be a tester. You’re also a bit too cold for this one. I would like to have a beautiful plant like this in my garden in Indiana, Valparaiso. Thanks for the presentation. Your climate is also a bit too cold for this one. You’re climate is probably a bit too cold for this one. I live in coastal NC, zone 8a, near Cape Lookout. Would love to grow one of these amazing giants. I have a huge lawn with many microclimes. I’m hopeful there’s one that would be beneficial for this wonderful new hybrid. Thanx, Teresa. 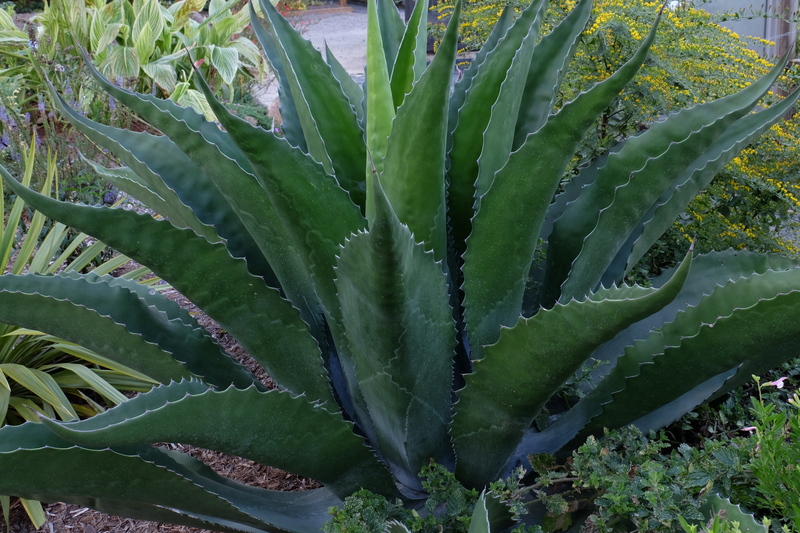 Teresa – You have a perfect climate for these and our new Agave ‘Bluebell Giants’ should be great in your climate…plant after the danger of frost has passed for this spring. Any hardy agaves for Long Island? Certainly…it depends on where you’re located. On the South Shore, there should be some pockets of Zone 7b, where you would have a much wider selection. Otherwise, select varieties on our list for zone 6-7a. Agave havardiana, Agave parryi v. parryi, and Agave neomexicana would be good choices. The key to survival is keeping them dry in the winter. In the wild agaves are native into Utah. I would love to experiment with at least one! Am I too late? Can I order it on your website? I’m in Hickory, NC. I just posted a picture on your Facebook of my 9 year old Ovatifolia covered in snow! Sure…they can be ordered from our website and we do still have some in stock. Very interested to have one of your Bluebell Giants Here in beautiful sunny Ventura Ca. As a tester or to purchase. Please hit me up.